Was this the UK's toughest ever historic rally? Competitors are saying that this year's Le Jog (Land’s End to John O’Groats) regularity rally, the 23rd running of the event, was one of the toughest ever, thanks to the harsh conditions encountered across much of the route. 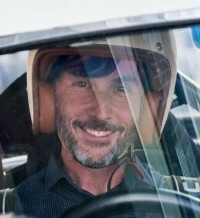 Fifty-three vehicles made the start at Land’s End with crews travelling from as far afield as Australia, USA, Canada and Europe to take place in the 1550-mile event, which is hosted by the Historic Endurance Rallying Organisation (HERO). The oldest car taking part was a 1957 MGA with German team Horst Pokroppa/Arno Bauschert on board. This was Pokroppa’s eighth Le Jog and although a long-standing competitor on the event he couldn't come close to Robert and Susan McClean, who would finish their 17th attempt at Le Jog with a silver medal. Starting out at Land’s End on Saturday, the event wound its way through Cornwall, Devon and Somerset before crossing the Severn Bridge into Wales as night fell. The ensuing section would set the tone for the event as the predicted snow deposited itself on the higher points and made forward motion increasingly difficult. Finishing in Chester at 3:15am on Sunday, crews took a brief rest before getting underway at 9am, by which point four inches of snow had fallen in under an hour. The fells and moorland of Lancashire, North Yorkshire, Northumberland and Cumbria gave way to the final regularity section on Sunday, which snaked between English and Scottish Kershope Forest before an overnight just outside Peebles at Cardrona. Uniquely Le Jog doesn’t have an overall winner and is probably the only rally that awards competitors for consistency, to achieve Gold Medal Status – the highest possible accolade. Crews must visit every single check point within a certain tolerance. In a twist of fate the very first Gold Medal winner, John Kiff, had completed 1400-plus miles without skipping a control, but the third to last section caught him and brother Rob out and all their hard work fell apart. The last section started on Monday from Cardrona with a beautiful Scottish winter morning greeting the event, heading past Edinburgh, KIllin and into Aviemore, where Le Jog made a final, brief stop before the final 280 mile push into John O’Groats. Le Jog will return in December 2018. Watch this space for the dates – and visit the HERO website.